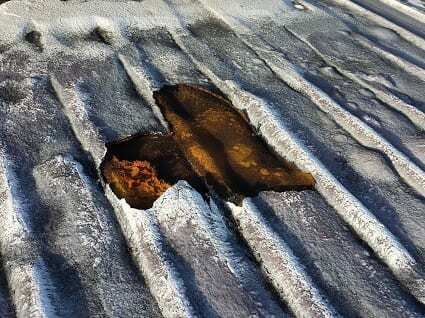 More than 12 active and annoying leaks sent this distribution warehouse seeking a long-term solution for their 10-year old metal roof. 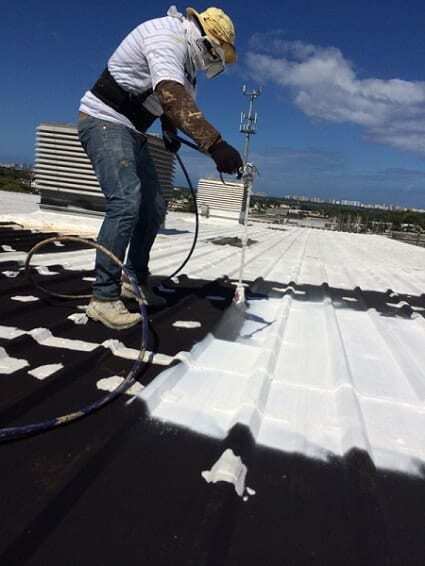 A distribution/manufacturing company in San Juan was tired of dealing with over 12 active, annoying leaks through their 10-year old metal roof system over their 33,000 sq. ft. warehouse. Around each of the 6 large HVAC units on the roof was sprayed polyurethane foam and acrylic coating installed by another roofer to try and seal these units in. The acrylic coating had deteriorated and cracked, exposing the foam to UV and changing its properties, turning it into a sponge. They had many leaks in these areas and some of the leaks were so bad the company could not utilize an entire section of their warehouse. This greatly affect their operations. The owners received their various proposals and Triton helped them analyze their options. First, they could tear off the entire metal roof and install a new one. This would be very disruptive and very expensive. Second, they could install a metal retrofit system or a single-ply retrofit directly on top of the existing metal. Not only was the cost of this high, but they would have thousands of fasteners drilled into their current roof and any future leak would trap water in between the two systems. This would result in widespread rust and damage. Third, they could install a fluid-applied system. They were first given a proposal to install an acrylic elastomeric coating. However, they learned acrylic coatings are permeable and allow water vapor transfer. Acrylics are not a proper substitute for a waterproofing membrane. Then they were given a proposal with the TRITOflex instant-set rubber system. With this, they would avoid tearing off their roof, avoid drilling a thousand more holes, or deal with another acrylic system like they already had around their HVAC units. Not only that, but TRITOflex has 1,900% elongation and is able to effectively flex with the existing metal roof, withstanding expansion and contraction. After reviewing their options, the client chose the Triton system and saved 60% in comparison to the proposals for a tear-off and the metal retrofit system. SRS Corporation made repairs to the existing roof, cleaned it, removed all of the damaged polyurethane foam, and then sprayed the TRITOflex rubber membrane in one coat, sealing up all the fasteners and joints instantly. With no disruptive odor, the employees working inside had no idea a new roof was being installed. It rained at some point nearly every day during TRITOflex installation and day after day, the leaks disappeared until they were eventually gone. SRS then spray-applied the TRITOtherm thermal protection coating on top of the membrane to provide the highest energy savings possible compared to any other white roof. In the Puerto Rican climate, this client will benefit for years to come! After seeing the performance of the Triton system on this roof, they decided to have the rest of their facilities roofed with the same system!